A celestial wonder, the Sun is a massive star that formed from a massive gravitational collapse when space dust and gas from a nebula collided, forming into an orb that is 100 times bigger and weighs over 300,000 times that of planet Earth. Made up of 70 per cent hydrogen and about 28 per cent helium (plus other gases), the Sun is the centre of our solar system and the largest celestial body anywhere near us. Essentially, this constant motion of high-temperature causes a nuclear reaction. In the core of the Sun, hydrogen turns into helium and causes a fusion – which moves to the surface of the Sun, escaping into space as electromagnetic radiation, a blinding light, and incredible levels of solar heat. 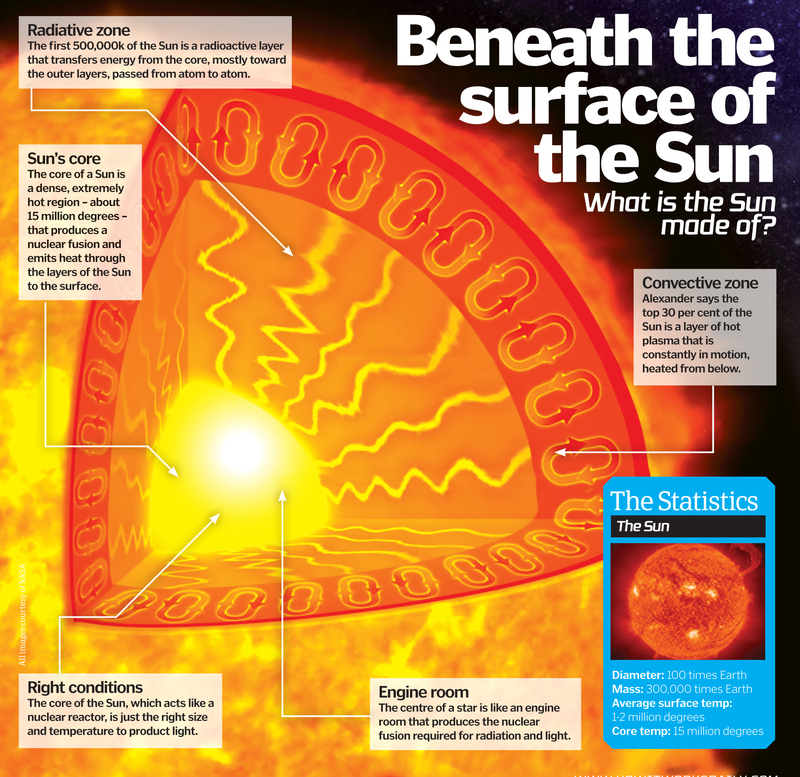 In fact, the core of the Sun is actually hotter than the surface, but when the fusion escapes from the surface, the temperature rises to over 1- 2 million degrees. Alexander explained that astronomers do not fully understand why the Sun’s atmosphere is so hot, but think it has something to do with a magnetic field. Far below the surface of the Sun, near the core, a strong magnetic field – which is the force created by the Sun’s high core temperature and nuclear fusion – emits a sunspot, which looks like a black dot on the Sun because it is about 1,000 degrees cooler than the surface temperature. Interestingly, a sunspot also causes the magnetic field required for solar flares and a CME. “A CME (coronal mass ejection) is an additional phenomenon which is separate but often accompanies the largest flares,” says Alexander, explaining how plasma from a CME ejects from the Sun at over 1 million miles per hour. Discover more amazing space facts in the latest issue of How It Works magazine. It’s available from all good retailers, or you can order it online from the ImagineShop. If you have a tablet or smartphone, you can also download the digital version onto your iOS or Android device. To make sure you never miss an issue of How It Works magazine, make sure you subscribe today! Does the Sun smell of anything? Next story Can we sense electric fields?